What are Red Bartlett pears? Imagine fruits with the classic Bartlett pear shape and all that wonderful sweetness, but in hues of blazing red. Red Bartlett pear trees are a joy in any garden, ornamental, fruitful and easy to grow. 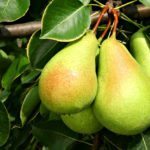 For tips on how to grow red Bartlett pears, read on. 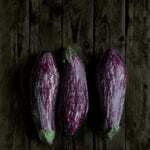 What are Red Bartlett Pears? If you are familiar with the classic yellow-green Bartlett pears, you won’t have any trouble recognizing Red Bartlett pears. The Red Bartlett pear tree produces typical “pear-shaped” pears, with a rounded bottom, a definitive shoulder and a small stem end. But they are red. The Red Bartlett was discovered as a “bud sport” shoot that developed spontaneously on a yellow Bartlett tree in Washington in 1938. The pear variety was then cultivated by pear growers. 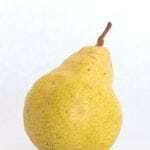 Most pears remain the same color from immaturity to maturity. However, yellow Bartlett pears change color as they ripen, turning from green to mellow yellow. And those growing Red Bartlett pears say that this variety does the same thing, but color evolves from a dark red to a brilliant red. You can eat Red Bartletts before they are ripe for a crunchy, tart texture, or you can wait until ripening is over and the big pears are sweet and juicy. The Red Bartlett pear harvest starts in late August or early September. If you are wondering how to grow Red Bartlett pears, remember that these pear trees only grow well in U.S. Department of Agriculture plant hardiness zone 4 or 5 through 8. So, if you live these zones, you can start growing Red Bartlett in your home orchard. For best results, plan on growing Red Bartlett pear trees in a full sun area of your garden. 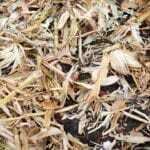 The trees require well-drained soil, and prefer loam with a pH level of 6.0 to 7.0. Like all fruit trees, they need regular irrigation and occasional feeding. While you may be dreaming of the Red Bartlett pear harvest when you plant your trees, you will have to wait a while. The average time for the Red Bartlett pear to bear fruit is four to six years. But don’t worry, the harvest is coming.